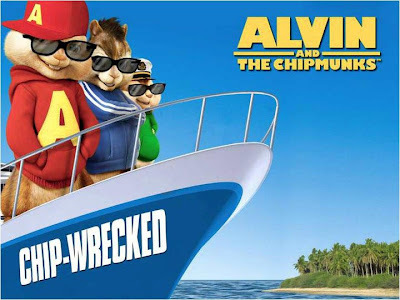 On Wednesday night, 7 December, 2011, I had the opportunity to catch the screening of Alvin & the Chipmunks 3: Chip-Wrecked. Fresh from The Muppets movie disappointment, I'm eagerly hoping that this kid-friendly movie will do way so much better than The Muppets movie. The movie starts off with Dave, the Chipmunks and Chipettes on their way boarding a cruise ship for a vacation before they're heading off to perform at the music awards. As usual, Alvin is up to his antics again and before long, they were restricted to playing shuffleboard. Bored out of his wits, Alvin decided to plan up something to escape from such a boring rut. After Dave dozed off like clockwork, Alvin decided to trade in Theodore's donuts for a kite from a chubby kid nearby. Alvin was using the kite as a parasail and it wasn't long before something went horribly wrong. All of the Chipmunks and Chipettes lost control of the kite and they then went overboard the ship. To Dave's horror, Dave tried to go after them but unintentionally had brought along Uncle Ian who was working as the mascot of the ship when he tried to stop him. Pretty soon, Dave and Ian too found themselves left behind by the cruise ship. The Chipmunks and Chipettes later found an island and went ashore there till Dave comes along to rescue them. After settling down for a period of time at the island. They soon found that there's another inhabitant on the island who had been there for 8 or 9 years. Unbeknown to them, the woman's motive at the island was actually to discover hidden gold from a map she possess and will do anything and stop at nothing to get to it. This poses a danger to the Chipmunks and Chipettes. Will they ever get off the island and make it to the music awards in time? Will they ever be reunited with Dave again? Find out what happens at the movie! Unlike the Muppets movie which merely made me feel old with nostalgic memories, this third installment of the Chipmunks movie is a really fun show to watch. I would rate this movie 4 stars out of 5. To me, The Muppets isn't that great a movie to watch. Hahaha, it sure is Iriene.